Ever since I installed my SAP HANA, express edition (HXE), instances on Google Cloud Platform I have been using them as my main platforms for development and different experiments. My experience has been so good that I feel it has to be shared so others do not miss on it. 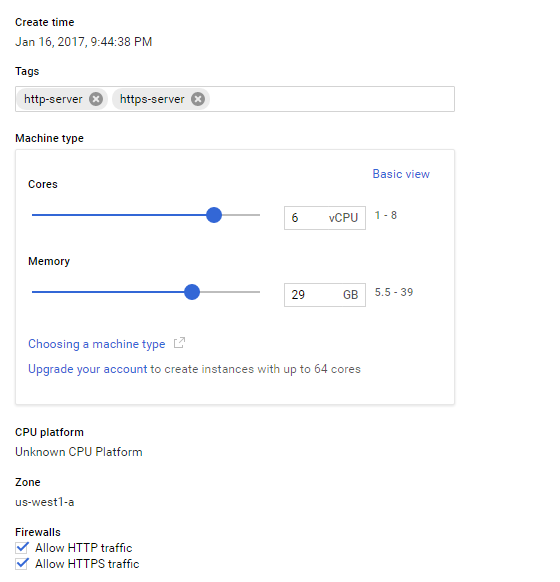 What I like about Google Cloud Platform (GCP) is that it makes it extremely easy to get my SAP HANA instances up and running when and how I want them. The web SSH client and GCloud console stand out as a star feature. Two clicks and you are logged in to the operating system, ready to cast some commands using the web interface. A month has passed since the initial blog about the installation of SAP HANA express edition instances on the Google Cloud Platform. I had installed the two configurations, one with the XS Advanced application and one with just the server. I later scaled the server-only with the XS Classic tooling . 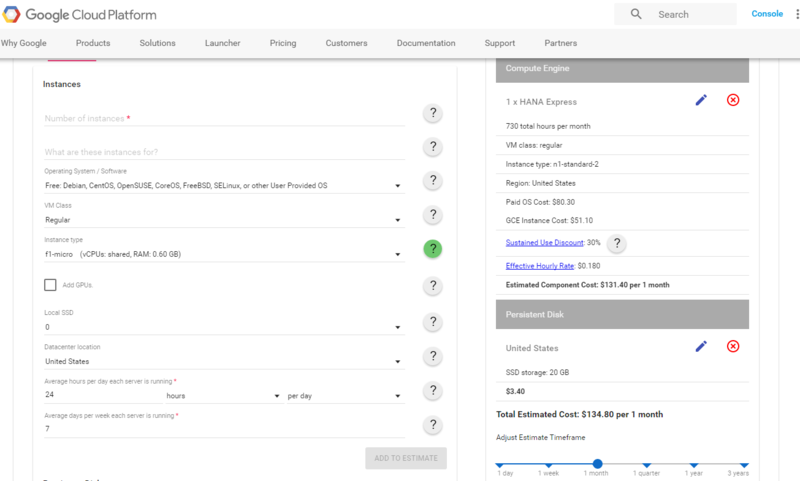 After building some applications and adding data into them, GCP warned me that my instances were overutilized and suggested a more cost-effective and better configuration. The statistics in the monitoring were in agreement, showing that the instances were hungry for more resources. Feeding more RAM and CPU to them was easy as sliding a bar or entering the exact amount of RAM I want and turning the machines back on. The only requirement to adding more resources is that the virtual machine is turned off. This requirement also applies to taking a snapshot of your instance. Other than the traditional uses of HXE, I sometimes like to test different configurations or simply try what I would not dare do in a productive or even shared environment. A snapshot allows me to go back to the point where the virtual machine was up and running before, for example, locking myself out. The best part is that taking a snapshot and recovering it is almost as fast a CTRL+Z. Now, what you (and your wallet) have been waiting for: The Price. The basic instance can run on as low as 0.20 USD/hour. Because I keep three flavors of HANA Express Edition (server only, Server only + XS Classic Tools and Full XS Advanced installation), I tend to turn them on and off as I need one or all of them. I was expecting a big reduction of the free initial credit that I was lucky to get from Google Cloud Platform when I signed up, but no: Unlike many other providers, Google Cloud Platform bills you by the minute after a minimum of 10 minutes. In other words, not only is it unbelievably cheap but it also takes off the pressure of taking into account what time it is before you turn the instance off. You can take a look at the billing principles and estimate your monthly costs in their comprehensive pricing site. Google Cloud Platform also sends you weekly emails as well as the bill. Consequently, there are no surprises at the end of the month if, for example, you forgot to turn off one of your instances. Do I need to remind you that SAP HANA, express edition, comes with a perpetual free license for productive use up to 32 GB RAM? In case this needs translation: You can have the transalytics, predictive, geospatial and real-time power of a world-class in-memory database licensed for free and a very low infrastructure cost. And to make things even sweeter, the good people at GCP extended my 60 day trial to 1 year, happy days! Keep those blogs coming, they are fantastic! 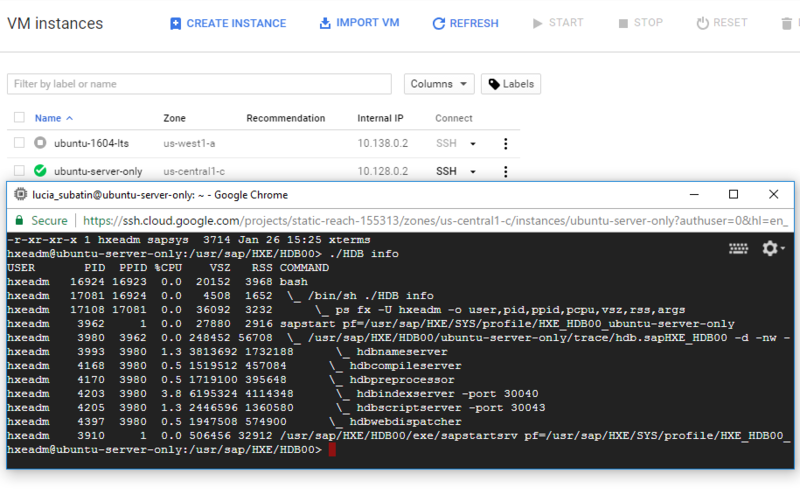 Thanks Lucia – the blog was helpful and I was able to install the HANA instance on GCP. I was getting error – /usr/lib/x86_64-linux-gnu/libstdc++.so.6: version `GLIBCXX_3.4.21′ not found during my first attempt. I tried manually installing lot of packages but didn’t go anywhere ..so did the installation again and it worked perfectly. agree with all you said about the HXE product, still I prefer to run it on an Intel NUC with 32GB ram which I can access from anywhere as well without counting the minutes. Particularly if you run other things like a media server etc. Of course, if there is no server at home it can make sense to pay the cloud. Great thing that SAP provides this product to the community!